Not that it is an excuse, but wow have these last couple weeks been hard on me. I have a multitude of stressors and emotions existing inside this momma heart and brain, but I am really focusing on fixing my eyes on God and His plan. We are faithful. He is merciful. Trying to dance in the rain instead of waiting for the storm to pass. Gabriella is on day 12 of her IV infusions. We actually went to clinic last Thursday and the doctor decided to bring her back in that afternoon for a 6 hour infusion of Cytogam, which is a bit more harsh than the at home IV med so they do it inpatient. We are hoping that that extra infusion flushed out any active CMV in her system and hopefully her bloodwork from this Thursday will show her in the clear. The spots on her skin have faded and no new area have appeared, which is a visual sign to me that we are over the CMV scare. We will go to clinic on Thursday and find out our fate of treatment. She will either be super conservative and do one more 6 hour infusion of Cytogam and continue the at home Ganciclovir for another week, or she will stop all treatments and put her on oral meds equivalent to the Gan. I'm hoping for the 'stop all meds' option. 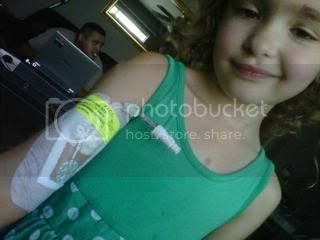 Honestly, I want this PICC line out and I want it out now. It is just a route for infection.... and I am not excited about that. Many of you nurses or heart moms may wonder why I am so eager to get this PICC out, or why I was so opposed to start. Well, I'll go ahead and spill my guts. My (step)dad died July 2003 of septic shock, of which he received via his PICC line port he had placed for dialysis. Of course, given his stroke/diabetes/kidney failure issues, his system was down as it was, but going into septic shock of course guided him to an untimely (to us) departure from this earth. The last thing I need is for my daughter, named after him and exists because his death made me realize life was too short to not grow my family, who had a stroke and was just like him afterwards, and who is also immunosuppressed, to get an infection in her post and go septic. And I know I normally have it 'all together' and do my homework on everything but you HAVE to allow me to be a hypochondriac on this one thing, right??? So Thursday we will find out the course of treatment. The beautiful thing about the peds transplant doctors at Loma Linda is that they have been doing this SO long, they don't feel the need to go standard textbook protocol on every patient. Instead, they tailor the best course of treatment for that specific individual based on years and years and years of experience in knowing what works for different types of people. That is why this is just a 'play it by ear' treatment.... because they are working on what would be best in Gabriella's outbreak of CMV and the way her body responded. This is also why they will be long distance treating Gabriella when we go back to AZ.... because you KNOW I will call them for EVERYTHING. Last night we were discharged from the hospital! Gabriella's 2 amazing post-transplant doctors worked Monday night on the best plan for Gabriella's treatment. Since it was a very new infection of CMV they found, and did not cause symptoms or distress to her heart, we were very fortunate to have a simple hospital stay. The biggest concern after doing her first few infusions of the medicine (Cytogam) she was given to stop the growth of the active CMV was how to keep the virus from reactivating. They decided the safest way was to send her home with an additional 10 days of IV infusion of the Ganciclovir, which prevents new CMV from growing. If they plan on doing the additional 3 infusions of Cytogam they will let me know tomorrow, but that depends on how much active CMV is still in her system. The home health nurse just left, giving me a 'tutorial' on the IV pump and meds. I do have to give myself credit and say that in spite of her not really giving me a hands on teaching AND not even listening to anything I said, I already knew what to do and merely went through the actions for the sake of the appointment. It is terribly difficult having someone talk to me like I have NO idea, when they themselves are completely unfamiliar with anything transplant related as they pretend to know. I'd much rather have someone ask me and truly listen to my answer to they themselves can educate themselves on things they might face again in the future. That is one thing I respect about our nurses and doctors at Loma Linda... they know I like to be informed and I know my stuff. Gabriella is now high risk for CMV. When her 10 days of this Ganciclovir is completed, she will go back on Valcyte, which is the oral form of the IV med and that she was on for the first 3 months post-transplant. We will most likely do another 3 months of that and take her off again. After that? See what happens. It will be trial and error. The worst part if even if she does well when she goes off Valcyte in 3 more months and does not get CMV again, she could get it at any time. The doctors have seen patients have an activation of it years after transplant. 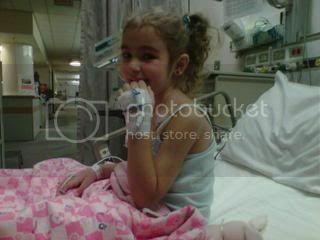 Gabriella was listed on February 11, 2010 for her new heart. On May 17, day 97, we got the call that they had a heart for her. Today is day 97 WITH her new heart. Time has definitely gone a lot faster in the 97 days post transplant than they did in those unpredictable waiting days. Ok, so we are back in the hospital, but big deal. We hit the critical 3 month mark without being admitted and I find victory in that. Gabriella is responding to IV treatment well. She received her second dose of Cytogam last night and is due for her third on the 27th. She is receiving Ganciclovir twice a day and the doc said if we can get her CMV levels under control she MAY let her go home on oral Ganciclovir and have us return for outpatient Cytogam infusion on the 27th, 3rd and 10th (approx). We won't know this until Monday or Tuesday though after her next set of labs are drawn. We both slept hard last night. The first night in the hospital again was hard on both of us. The nurse even commented how we never moved when he came in... Lol. We have had some friends step up and help hang out with PJ various days for this stay so Paul can come up and see Gabriella. Its been a blessing to see our lives be so blessed even when we are so far from home! The doctor did tell us that if we control this now it will not affect our estimate of going home mid-September. Leaving will be so bittersweet! Well, this is why we are still close to our beloved Loma Linda University. Tuesday of this past week, Gabriella started sniffling. This was her first 'sickness' since transplant, so it was like I was a first time mom with our first cootie ever. I called transplant team and asked what to do for her snotty nose. He sent me to grab a med from the pharmacy and I felt ok after getting their reassurance. Wednesday she was doing better. Thursday she woke with a gnarly cough, and before heading into what was supposed to be our ECHO only appointment. This was our FIRST time going 2 full weeks without seeing the doctors! Instead, they told me to come in and have them check her out. We went in for our unplanned clinic day, which meant an unplanned co-pay (grrr). They went ahead and ordered her an antibiotic just to be safe. Given that she hadn't spiked a fever and her nasal issues went away pretty quick, my guess it was just allergies but she was treating it as a mild bronchitis. I pointed out to the doctor these odd spots on Gabriella. She has had these clusters of freckled looking spots come and go in little 3" clusters all over her torso and arms. At first I thought they were evidence of our excursions to the beach on the weekends, but when they would come and go during the week, I started doubting my theory. The doctor told me she wanted to draw some labs and see if we could find something in there that might be causing these travelling freckles. Fast forward to tonight. We went to grab some dinner since our cubbards are empty and time has been sparse to stock up this week. We needed to go to Target for a few things, but wanted to walk around the outdoor mall for a bit while the sun was still shining. I got a call around 630pm from Loma Linda (their assigned ring tone on my phone is Gabriella singing Twinkle Twinkle just weeks before her stroke). What is CMV? Cytomegalovirus. Most everyone (50-85%) carries a dormant form of CMV. Both Gabriella and her angel Abbie were positive for CMV prior to transplant, which should have worked in her favor. It is harmless... well, in all of us healthy, normal folk. For the few amazing transplant people who follow me, you might know about CMV prevention already. Gabriella was on Valcyte for the first 3 months, to which it's sole purpose was preventing the CMV virus from becoming active in a person who's immune system is suppressed. At 3 months, they discontinue this medication since the risk for CMV declines and their bodies are slowly rebuilding a small degree of immune system. Gabriella was actually off of it at 2½ months because a combination of this med and another was causing neutropenia, low white blood cell counts. Coincidentally, these spots started forming soon after we stopped the Valcyte, another possible contributing factor to this finding. The one symptom kids NORMALLY have that lead doctors to discover an emergence of CMV is super high fevers, but Gabriella never had this. It is possible that the dormant virus in the new sparkly heart became active when Gabriella's body had her immune system suppressed and was taken off the anti-CMV med. Not typical, not common in kiddos according to my coordinator. What can CMV do to her? Well, I asked tonight what the worst case scenario was if treatment didn't work to tame the CMV. Rejection. Yeah, thats just about the worst case I could have dreamt of.... because rejection opens a whole new encyclopedia of outcomes. Ones I choose to ignore, because as I have previously stated.... rejection is our biggest enemy and we have this kryptonite called prayer we use to keep it out. How are they treating her? They are doing an IV drip of Ganciclvir, which is an anti-viral to slow the growth of CMV. They are also using an IV medication called Cytogam. This is derived from human plasma and is an antibody to the cytomegalovirus. She will receive this infusion inpatient on days 1 2 and 7 and outpatient on days 14 and 21, which means we will be fighting this off until mid-September. Kinda wondering if this throws off our go-home estimate of mid-sept?? I'm guessing so. So we are all settled into our room. Thankfully, transplant kids are near royalty around this place and we got a private room, even though she is not contagious nor is her white blood cells low enough to warrant isolation. Gabriella dealt with her nerves by being so chatty I could hardly fill the nurses in on her recent history.... but it was so great to hear her talking so much. She was comparing things to being in room 4 (where she recovered her transplant).... which has so many more owies than this room. She is fast asleep now on this unexpected evening. I surely thought we would have had a sweet treat at the mall, bought something the kids didn't need just because they are so cute when they ask, and snuggled into our beds tonight to wake and get use out of our family pass to the Aquarium of the Pacific. Even though that is not how it went, I couldn't feel better about sitting here, having my daughter infused with medication to save her from detrimental damage to her precious heart, all because our transplant team is just that amazing to find it this quick. One thing Gabriella is taking like such a big girl is that I am no longer leaving Monday morning to go get our new little addition to the family, our new doggie. I was able to cancel or postpone most of my arrangements, but not purchasing the trip insurance on my killer deal through Priceline for my hotel turned extreme savings into a monetary loss. We talked all about how I will go when she gets out of the hospital and is done with her treatments to get her doggie so it gives her something to look forward to after all of these IV's and blood draws and boring days in the hospital. Also, we are up here with our precious friends, Nick and Lisa.... Mathilda's parents. Sweet Mathilda (just over 2 months old) is readmitted to the hospital and is having a very hard time, so I ask that you PLEASE direct your prayers her way. Her little body is in distress and they are searching for the root cause. As much as I love seeing them, the 5800 wing of Loma Linda Children's is not on my top 10 list of places to hang out with them. 17 months ago tomorrow I found out Gabriella had a sick heart. 15 months ago last week I found out she would die without a transplant. 6 months ago last week she was listed on the UNOS database for a new heart. One day my world came crashing down, I'll never be the same. They told me that my child was sick. I thought, "am I to blame"? I don't think I can handle this. I am really not that strong. It seemed my heart was breaking. I have loved her for so long. I will not give up on this child. I will listen to your advice. I will give my child any chance. No matter what the price. I will learn all that I need to help my child thrive. I'll even use that feeding tube. My child must survive! Will she need a lot of therapy? Will she gain the needed weight? Please God, help me do this. I will accept our fate. When the monitors beep at night, it serves as my reminder. How many parents would love that sound. Tomorrow I will be kinder. As another Angel earns his wings, I run to my child's bed. I watch her sleep for quite a while. I bend down and kiss her head. I cry for the parents whose hearts have been broken. I look to You wondering why? Oh Lord, I just can't know your ways....no matter how I try. And yet, I trust you hold her life, and guide us through each day. My mind says savor each moment she's here, but my heart begs, "PLEASE let her stay"! From pacing the surgical waiting room, to sitting by her bed. From wishing for a good nights sleep, to learning every med. From wondering, "will she be alright? ", to watching her reach out her hands. With every smile my heart just melts, despite life's harsh demands. For all who see that faded line. I look to them and smile. You see MY child is loved so much. I would face ANY trial. That scar I trace with my finger (It's the door to her beautiful NEW heart). God must have known how much I'd love her (Just as He loved her from the start). A heart mom is always a heart mom. Now wise beyond her years. For those who have angels in heaven, our hearts share in all of your tears. Every day I will try and remember, I was chosen for her (and no other). I will always embrace that beautiful day.......When I became a "Heart Mom". I want you to meet Abbie. 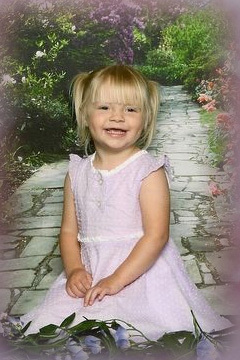 She was born March 18, 2007 in Washington state to a loving mom and dad, Angie & Kurt, the same age as Paul and I. She was born the little sister to Lillian, who turned 6 in June. She was a little spitfire with an infectious personality that everyone loved. Advanced in her development, empathetic and loving... she was also the boss. She had aunts and uncles and cousins and grandparents and friends that all loved her and were blessed by her time on earth. She loved pink and purple, dancing, Disney princesses and anything sparkly. As much as she was girly, she also loved bugs and the outdoors and was a dare devil! Abbie was excited to start school one day and wanted to be a doctor when she grew up. She loved others so much that she wanted to help people in need. Abbie was more precious than can be summarized in a paragraph. Three months ago today, on May 15, 2010, Abbie made an unexpected entrance into heaven. While playing at the neighbor's house on Friday the 14, she endured trauma to her delicate skull when a play structure collapsed on her. She was rushed to the hospital, but after a day on life support with no brain activity, her parents made the painstaking decision to let her go and be free of pain and donate her organs. Abbie may not have become a doctor, but she saved a one year old child with her kidneys, an adult with her liver, her beautiful eyes went to the eye bank to give someone sight and her heart to our beloved Gabriella. She will forever live on through the lives she touched. I have known about Abbie for some time, but have attempted to keep her information confidential for the sake of the grieving process for her family. I spoke with her mom about sharing her story, to which she gave me the ok to do. As I mentioned on my blog previously, I went about contacting Gabriella's donor family by sending my (9 page) letter to the procurement agency for review and forwarding around soon after Memorial Day. Abbie's mom accepted the letter right away and wrote back almost immediately. But it takes time for the procurement agency to send letters back and forth, so Abbie's mom reached out to me through email before I received her letter just to introduce herself and begin personal communication. When I got her letter, I wept reading the details of Abbie's accident. She shared with me in personal detail everything that happened. I have been grieving the loss of Abbie since Gabriella's transplant. I have felt a connection to her and her family since I saw Gabriella with the beating heart of another child at 230am on May 18. I took on a mothers grief, seeing how close I was to being in the very position Gabriella's donor mother was living, but also filling in vital parts of our own journey with the very details that completed it. It is now our responsibility to keep Abbie alive through Gabriella. Gabriella has been our hero, and Abbie is her guardian angel and our new hero. Without Abbie and the selfless decision her parents made, Gabriella would not be alive to experience life. Whatever Gabriella accomplishes in her life will not be without Abbie. 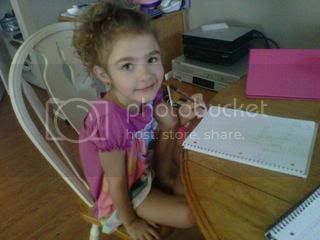 Abbie's mom will be writing a letter/blog for me to post on Gabriella's website one day, when she is ready. I couldn't be more honored to know this woman and feel so blessed to have formed the bond we have over such circumstances. She is family, her husband and daughter and extended family as well. We have been connected through Gods divine plan and will forever have a bond unlike any other. Abbie gave Gabriella life in a way no one else could. For so long I asked you all to pray for Gabriella's donor family. Since the day we knew she would require a heart transplant, I began including whoever these angels would be in our prayer requests. Now, we know who they are, which enables us to pray for specifically. We can place a face, a family, and a life with those words 'sparkly heart' and 'donor family'. I ask that you please pray for her sister Lillian, who saw her entire accident happen and tried to save her little sister by lifting the structure off of her. She is struggling with so much right now, and is only 6 years old. And also for Abbie's parents and their grieving hearts. They are still struggling and dealing with life without Abbie and it is not something they will ever get over. You all have been so amazing at lifting us up and wrapping your words around us like a hug. If you feel you would like to post any condolences to the family of Abbie, notes or anything relevant... please comment on this entry. Abbie's mom checks in with Gabriella's website and I am sure she would love to feel your loving words around her like I have over the past year and a half journey. 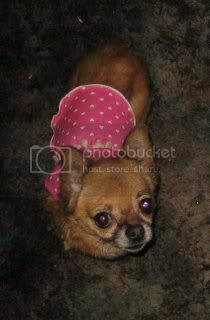 Gabriella has always been a little dog kind of girl. She loves to be motherly, and little dogs are a way for her to express that with something alive. Between my mom's little dogs she's had, our friend's puppy and Tiger the therapy dog at Phoenix Children's, she has grown to be very fond of little furry dogs over the past year. Paul and I on the other hand are big dog people. We loved our pitbull and english bulldog, and tend to prefer big breeds! Agreeing on small dogs was hit and miss with us.... french bulldog, boston terrier..... yeah, thats about it. Last year when Gabriella suffered her stroke, we promised that when she got her new sparkly heart and we settled into our new home (living with my mom at that time) we would get her a puppy. I recently started considering breeds and Paul and I were still on different pages as far as what kind of dog to look for. I had a woman contact me a year ago, the cousin-in-law to a friend of mine. She sent me a message that she was following Gabriella's story and posted about Gabriella on her own blog. I added her to my blog reader and have followed her ever since. She posts beautiful pictures of their region in Oregon, blogs on her general life happenings and pictures of the dogs she meets at the shelter she volunteers at. Then Gidgett found us. 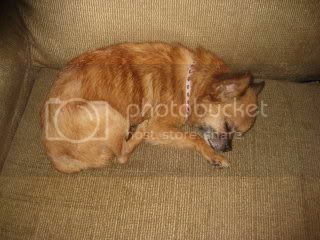 My blog friend posted an entry on this little Chihuahua Pomeranian mix that she was fostering from the shelter. I saw 2 pictures of her and felt connected. I showed Gabriella the doggie on my screen and her high pitched 'awwwwwwww! i want her!' was enough to make me write a check then and there for the highest bid! Then I showed her to Paul, who to my major surprise melted over her sweet face. 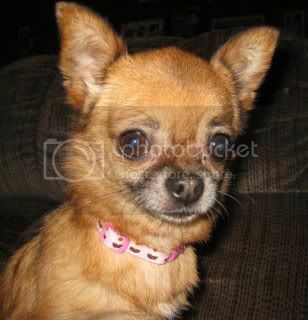 I emailed my blog friend and asked about Gidgett, and told her we wanted to adopt her! As impulsive, unreasonable and ridiculous as it sounds, right? After a few days of communication with her and the woman at the shelter, it turns out Gidgett the chihuahua was not shown the amount of love her sweet little face deserved. Her owners dropped her off and wanted her euthanized because they 'said' she had parvo. They were more worried about their dog carrier than the sweetheart in it. Turns out the parvo test came back negative and all she needed was some food, water and $10 in antibiotics! Gidgett didn't do well in the shelter setting, but proved to recover and transform after being in the loving home of my blog friend. All the way up in Oregon. So as I mentioned, she found us. And everything has worked out so amazing that we have to take her. I found an amazing deal on a round trip flight to Oregon at the end of August to go get her and bring her to us. The shelter is signing her over to me without fee since I am travelling to get her. I still figure this way is a TON less than paying the $300-500 fee most dog breeders charge, and not much more than an adoption fee locally if we rescued. The best part is we are able to rescue a dog without the worry that she will bring kennel cooties to my Gabriella, since she is being fostered at a family's home, which is well worth the travel! She will probably live with our dear friend back in AZ, who happens to be the most adoring dog owner EVER, for a couple weeks until we head back to Arizona mid-September. Then we can bring her home to our little space of AZ! Gabriella is on cloud 9 knowing she will have a little dog, and was too excited to pick out a 'necklace' for her! The best part for me is that this feels so normal. We are at the tail end of a year and a half of holding out on anything and everything because our life was so uncertain. Discovering that our Gabriella had a fatal congenital heart defect. Moving from location to location in preparation for transplant. Losing half of our income and adjusting to how short we live monthly. Facing her unexpected stroke that changed the dynamic of our family forever. But now we are looking at going home in September, having a dog, settling back into our apartment we only lived in for 5 weeks before the call and forming a new normal of this thing we call life. I promised back in February on this post: TEN that I'd post a follow up on Gabriella counting to 10 crystal clear and on her own..... please visit that last blog to see her before video! Also known as a 'Right Bundle Branch Block', WebMd defines it as: "Bundle Branch Block: Normally, the electrical impulse travels down both the right and left bundle branches at the same speed and the ventricles contract at the same time. If there is a block in one of the branches, it's called a bundle branch block. A bundle branch block causes one ventricle to contract just after the other ventricle." When Gabriella's precious sparkly heart was transported from the location of her angel donor to us in Southern California, the cold water it was stored in can cause a slight change to the Right ventricle. I hate using the word damage, because it is not as negative as that sounds, but for lack of a better word I will. The damage the right ventricle sustained from the cold water causes what the definition above states, a contraction (beat) slightly delayed in the right verses the left ventricles, sounding like a horses gallop. It was possible we didn't hear the gallop noise this condition was making because her heart rate was so fast up until a few weeks ago. She ran 130-140 for the first 10 weeks post transplant, and leveled out at a normal 110 range when her and her heart calmed together. When she leveled out, the sound was noticeable, and combined with the other symptoms presented like rejection. The good news is this is seen occasionally in heart transplant kiddos, and shouldn't cause concerns. It will be something I have to mention to doctors who hear her heart for the first time, since that sound is commonly seen in rejection. The bad thing is we won't catch a rejection episode based on heart sounds now... so thats a bummer. But in light of everything overall and all we have to worry about, this is minor and mostly innocent. As for her appetite and weight loss, we are thinking it is meds. Gabriella is metabolizing her meds weird and we finally found a good balance for one of the 2 immunosuppressants, Neoral (cyclosporine). The 2nd one she is on, CellCept, paired with her anti-viral, Valcyte, is causing her white blood cells to constantly bottom out, so that will be what the docs work on next. If the CellCept is not in the right ranges, is can cause belly aches, which in result will make her loose her appetite and loose weight! My token phrase lately.... 'how will I ever leave these doctors at Loma Linda???'. But, we have to... and will probably head back to Arizona mid to late September. Of course, with plans to come back in November for clinic! Ok, so this is much unlike all of the other 'first day of school' pictures you will see on peoples blogs, of kids in their new outfits, freshly washed hair & fancy backpacks. I had dreamt of that day I'd take that same picture of my curly haired princess. It probably would have been 2 weeks ago when the schools in our town started class. Granted, I still wish I was taking that picture. As I watch all of my momma friends I bonded with so closely 6 years ago in our pregnancy stages send their big kids to Kindergarten, I envy their experience. Of course, it isn't me unless I focus on the alternative. Sure, I can sit and sulk, or I can find joy in what we have. Gabriella is alive, here with me, and I am able to spend all day with her and teach her the basics myself. We started home schooling today, and I took my own unique picture of her.... one you won't see on many blogs! I spent most of the lessons evaluating her. Our Kindergarten experience is far too unique anyways, given her stroke gave us quite the hurdle to overcome. Not only do we need to learn all of the normal K things, we need to work on getting her talking at a K level! And when she learns something, she may know it but not be able to tell me she knows it... so we will focus on our own personalized schooling style through the next year to get her on track. Gabriella thrives on praise and shuts down on failure. She is much like me, and if she does not succeed she is closer to throwing in the towel than pushing on. With her speech delay, I think I can better maintain that at home where she isn't comparing herself to the other kids and can show her the one on one she needs to succeed through her own special hurdle. Home schooling will also serve in our favor due to her sporadic yet frequent doctors visits and keeping her healthy in this highly immunosuppressed time. We will return back to Arizona 2 months into the school year, where she'd miss the beginning of school. Also, flu season is right around the corner... and with her immunity being so low and 5-6 year olds being cootie bugs, we just CANNOT risk that. Kindergarten is not required in Arizona, so my home schooling is not exactly necessary. But had we been home and had she not walked the journey she has, she would be going with her cousin to K and learning all she needs to in this time. I want to treat K like it IS required and get her ready for 1st grade, just in case she wants to go to school and not be home schooled at that time. When we return home, though, the school system will come to our home and assist us with therapies as well as returning to clinic speech therapy with the lovely Mrs Lisa. With the help of some awesome HSing friends, we built our own little lesson plan for the year with a combo of programs I bought. We started today with writing where I identified how many letters she could write based on my verbal command as well as learning how to write the 'new' letter F. We did math (counting) where my worst worry was made true. Since her stroke, her hardest thing to retrieve has been numbers... she has only retrieved how to count to 5 since her stroke 10 months ago, and even though we ONLY added the number 6 to that today she still cannot remember it. This is due to her expressive aphasia so I am going to need to get very creative to teach her counting (song?). She then worked on reading, which I think is going to be her strong suit. She already has mastered 2 new letters sounds in one day, so I am super excited to see how she progresses with that! Our bible lesson & art/science were on hold because I need to access a printer to get my materials, so hopefully tonight I can run and do it! And we have a 'basics' lesson at the end of the day where I will do colors, shapes, money, time, comparisons, etc with her. Today we evaluated how well she could verbalize her colors and shapes... again a hurdle in itself because of the speech delay. So that was our day! I figure we will have school days 3-4 times a week, depending on doctors appointments. And I'm super excited for the next year!!!!!!!!! !